All Day - Julian Collins, independent professional joiner, and Christopher Hall, 'The Gentleman Joiner', will be demonstrating a range of DeWALT and Stanley products including the revolutionary new DeWALT XR FLEXVOLT 54V system and heavy-duty cordless power tools that offer runtime and performance that has never before been seen in cordless tools. will be demonstrating a range of DeWALT and Stanley products including new tools from the DeWALT XR FLEXVOLT 54V system and heavy-duty cordless power tools offering runtime and performance that has never before been seen in cordless tools. There will also be on-going demonstrations of Bostitch nail guns, in the new outdoor display area. See on-going demonstrations of Bosch's latest range of tools and accessories. Get hands on with the extensive range of mains and cordless tools including the new ProCORE18V battery series. Also demonstrations of the laser range of tools including the new GLM-120C and ZAMO laser measures. Look out for special show offers and deals and experts will be on hand to advise you and answer your questions. Dremel will be demonstrating it's range of rotary and compact tools, including Moto-saw (2 in 1 scroll-saw) and innovations such as EZ Change and EZ Speed Clic range of accessories. There will also be a range of special promotional kits, offering exceptional value. Festool will be showcasing their range of quality tools plus new tools including the ISC240 cordless insulating material saw and Bluetooth remote control modules for dust extractors. Demonstrations from the expert team will be available throughout each day and there will be an outdoor area with additional tools and demonstrations. Learn more about the Festool 18V range and understand more about clean working with the range of Festool dust extractors. Come along to meet the Festool team, demo the range and learn more about each tool. The new DLS110Z Twin 18v Brushless 260mm Slide Compound Mitre Saw will be used to cut the slats needed for the Pallet Chairs being constructed during the show (by kind permission of Good Woodworking). Makita will also showcase the 18v DRT50 Router Trimmer and the DBN50 18v Brad Nailer. To assemble the chair we will use our 10.8v (12v Max) CLX202AJ 2 piece kit, and also display a complete range of 10.8v (12v Max) products including the PT354DZ Pin Nailer & TM30D Multi Tool. Outside the Grounds Maintenance Team will be showing the new range of 18v LXT Linetrimmers, DUR188LZ & DUR189Z. The DUR188LZ is a 2-Part Design for Easy Transport/Storeage. The 18v x 2 Brushless Split Shaft DUX60Z will also be featured along with all the attachments including Pole Saw and Hedge Trimmer. After a fantastic first show in 2017, Woodworking Live from Record Power is returning for 2018! Record Power are passionate about woodwork and delivering the best quality and value tools possible to help woodworkers realise their full potential. This exciting show brings together some of the UK’s most well-respected and popular woodworkers in one place for three days of inspiration, creativity and entertainment. 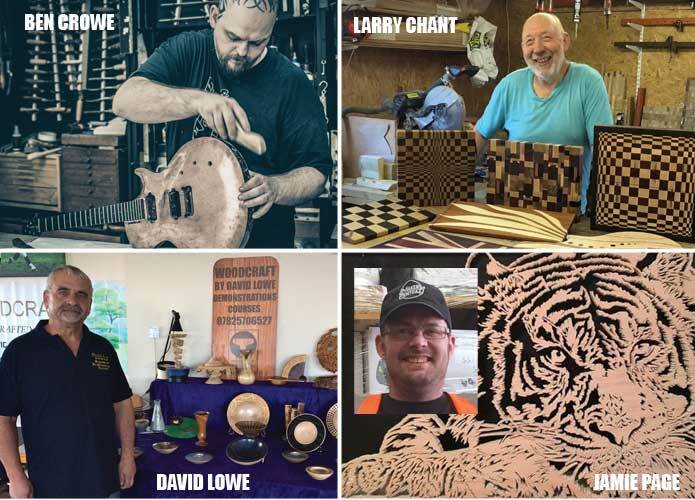 Surrey Association of Woodturners - Representatives from this well-established local woodturning club will be performing demonstrations throughout the show. They will also be available to discuss the club, its activities and the benefits of joining. Make a Pen for Free! 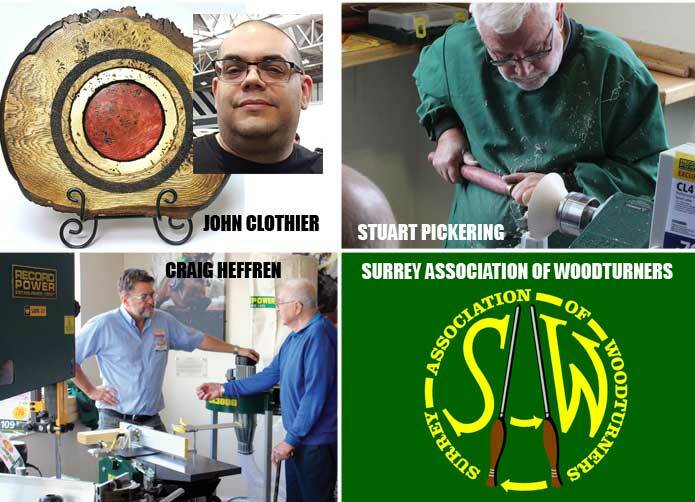 The Surrey Association of Woodturners will be offering free pen turning tuition to show visitors! All participants get to keep the pen they’ve made. Places are allocated on a first-come-first-serve basis so please visit the stand early to avoid disappointment. Demonstrations running throughout the day covering the Trend range of routers, router cutters, router jigs and router accessories. Andy King will be on the stand to offer his woodworking expertise and James Barry will be demonstrating the full range of diamond sharpening stones.